5 Questions with Junction 56 Distillery | Rrampt. The much-anticipated Whisky & Blues 2019 kicks off this weekend at Heartwood Concert Hall. For many, the emphasis is on the tunes we’ll be exposed to – this year, an award-winning 9-piece blues group from the Hammer, Andre Bisson Band, and while we know they’ll get some feet tapping and some asses out of their seats, they’re only half of what makes this event unique. 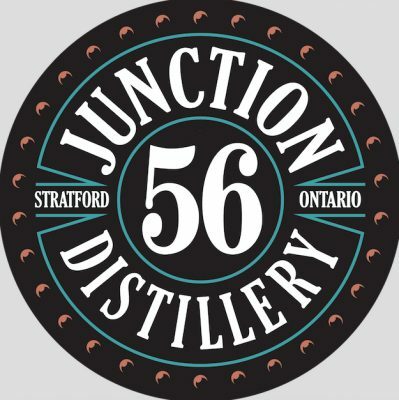 The crew from Stratford’s craft distillery, Junction 56, will be on-site talking to patrons about their products, their process, and sampling a few of their products to complement a specially curated Canadian whisky menu using Junction 56’s fledgling Canadian Whisky. 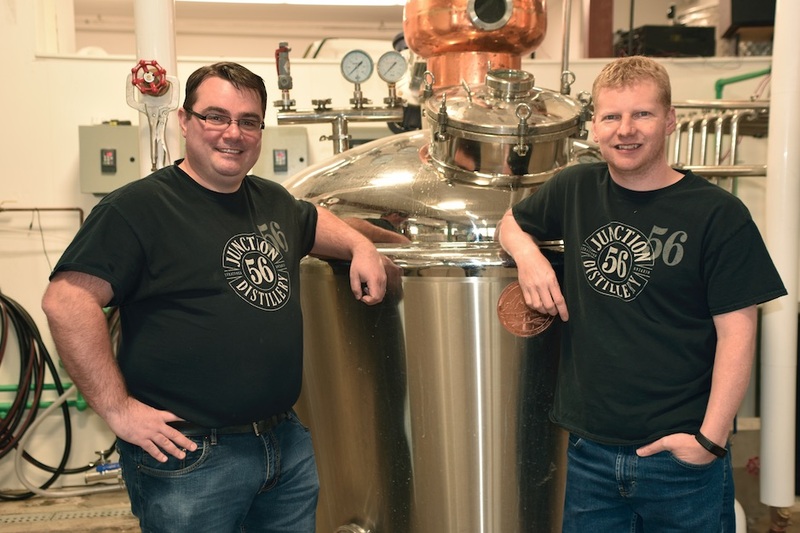 We sat down with owners, James Donnelly and Mike Heisz, to chat whisky, blues, and how these two Bruce County boys keep their products local with a heavy-handed dedication to quality. Rrampt: Let’s talk a bit about the history of the distillery – in a province overwhelmed by craft breweries in recent years, distilling is still considered by many to be the wild west. Why push for whisky, gin, and spirits overall – and where did the inspiration to set up shop come from? Mike: I was actually at a whisky tasting event in Stratford about 7 years ago. After tasting all the whiskies I turned to someone and said ‘we should make a barrel of whisky (laughs). I meant to make a barrel of whisky at home, and researched it a bit more and realized it was illegal and it’s actually hard to make that much whisky – so that led me to craft distilling as an industry. I started researching and got really interested in it. Low and behold I quit [working for] Blackberry where I was before this, and started working on this in 2014 and opened the doors in 2015. James: In terms of a licensing perspective, it wasn’t much different [from craft brewing] except for the fact it was new for the people issuing licenses. There was a little bit of hiccuping going on there – but in general, it wasn’t that hard. In terms of establishing a market, it’s entirely different and much more difficult. It’s a bit more cash-intensive up front for distilling, and once you get going the taxation is a lot more than it is on beer, so it takes a lot more volume to see a profit. That’s why I think you see a lot more breweries pop up — it’s easier to open, not as much capital to start up, and you can turn around and start making money fairly easily. Rrampt: I’m also interested in how the name, Junction 56, came about. James: When Mike was setting this up he wanted to be proudly local. He did some research on the history of Stratford and it was in 1856 when the two major railways came to Stratford – and the town was really built up around the railway industry. The distillery itself is about 15 feet from the one track, and a block from the other track, and a block from the junction of the two – so we’re right in between the two major tracks that Stratford was built up around, so Junction 56 is an ode to Stratford, but there are a ton of towns built around the railway across Ontario, so it’s also relatable across the province. In Canada, chances are you’ve heard someone order up a rye. What they’re after, subliminally, is a Canadian whisky – with rye becoming the namesake of the Great White North’s spirit game. There’s a big difference in the two, but it’s the differences from Bourbon and Scotch that make up the bulk of reasoning when ordering a shot of vitamin R.
And for the record: we Canadians, the Scots, and the Japanese – all fine purveyors of deliciously robust spirits spell it “whisky,” while our American and Irish friends spell it “whiskey.” One of the major differences in spelling comes from varying translations of uisge beatha, the original name for whisky, between Irish and Scotch Gaelic, while others come from errors – like the one in the title of the 1908 Royal Commission on Whiskey and other Potable Spirits submitted by the British government to Parliament – but, we digress. Rrampt: Your gin and vodka routinely receive rave reviews – we’re focusing directly on your whisky for this show – can you explain a bit about the process of your whisky production? We’re interested to know what makes your Canadian whisky unique, where the ingredients come from, and how it was developed. Mike: “With all of our products, the key pillars are two things: we aim for a very smooth product in the way they drink, and very flavourful products. With whisky we started down the road aiming for a Canadian whisky – we wanted it to be identified as Canadian and not a different style – but to impart a fair bit of flavour. Most Canadian whiskies tend to work the blander side of whisky and we wanted to have a very robust and flavorful version. That leads into the mash recipe we use for grain. Rrampt: So the story goes you’re both from Bruce County – the show is taking place in Owen Sound – a notoriously rough and tumble port town known for its love of drink – this seems like a perfect match. I’m interested to know about your expansion plans in the area, and when folks can find Junction 56 products in local bars and LCBOs. James: Mike’s from Formosa, and I’m from Pinkerton. We grew up in the area. Went to high school in Walkerton. Mike’s wife is from the Owen Sound area – we’re all definitely from the area. Our corn and wheat come from Mike’s cousin’s farm just outside Chepstow, he grows all the corn and wheat for our products – so definitely Bruce County boys and proud to be from there and support the farms up there as well… We’re getting LCBO coverage and we’re expanding that as much as we can as quickly as we can… I think Owen Sound’s LCBO has two of three of our products now. Walkerton, Kincardine, Port Elgin all have at least one, but more like three or four of our products. We have our standard vodka, our standard gin, and a black raspberry gin which was just released last summer. We also have a cinnamon liquor which we call Fireshine and we have a Moonshine product in LCBOs as well. Rrampt: Whisky & Blues music is a classic combo we see time and time again, and many spirits and even beer producers often cite an homage to music, art, or even a place or attitude to describe their inspiration or efforts. If Junction 56 Canadian whisky was a blues artist, who would it be, and why? 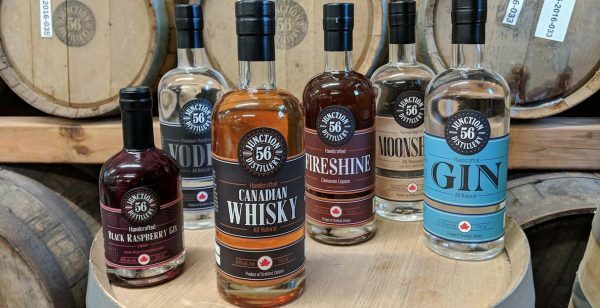 In 2018, Junction 56’s vodka won the Gold Medal and Best In Class awards in the Canadian Artisan Spirit Competition. 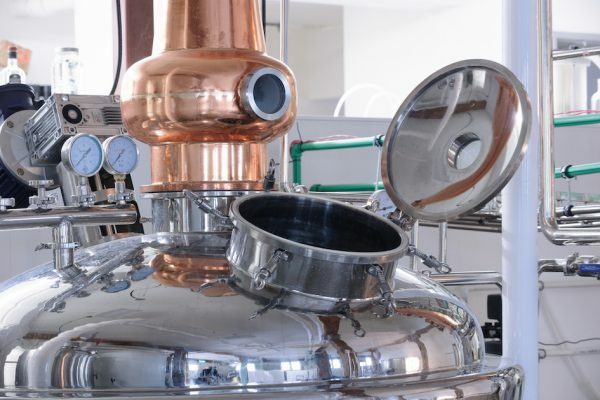 They’ve also won medals for their gin and Fireshine products in the past, notably from the world-renowned San Francisco Spirits Competition, and the American Distilling Institute.